Yes, fellow Martians, felines and others, birthdays may be pagan in origin, or something – is there anything Professor Google doesn’t know? 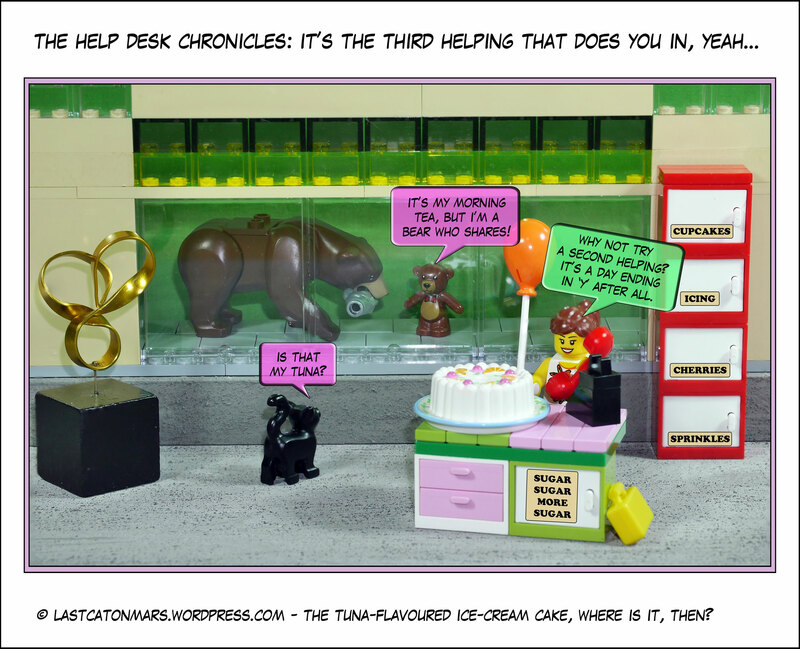 – but there’s cake, and your peeps, and even others, tend to be kinder on your ‘special’ day. Of course, they may not be kinder to you exactly, but there’s something in the air, don’t you agree, and it isn’t all pollen-based. In any case, here is a special hello and happy day of days to our fellow Martian, Emma. May the wishing well of excellent occasions on which to eat cake, or cheesecake if you’re very lucky, bestow its every blessing upon you. 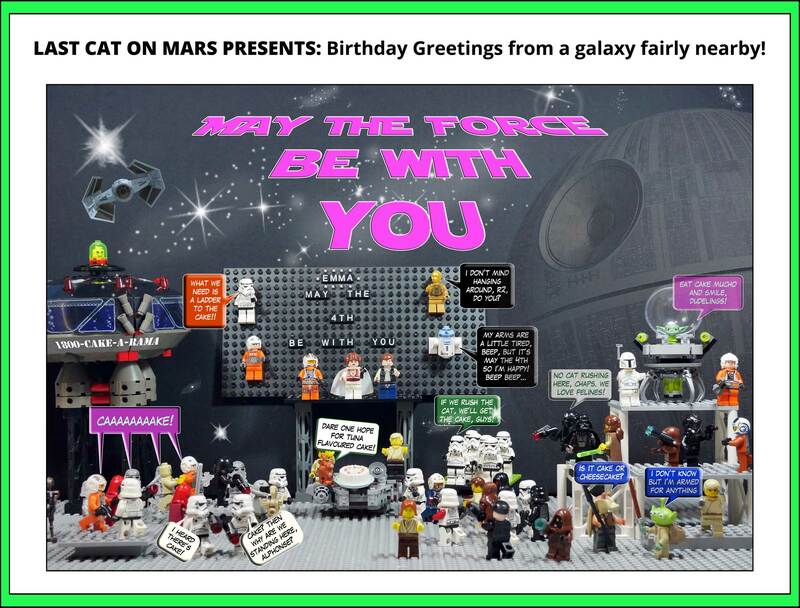 This entry was posted in Special Occasions and tagged aliens, cake, Emma's birthday, lego, May the 4th, May the Force be With You, minifigures, Star Wars on May 4, 2017 by Jay Verney. 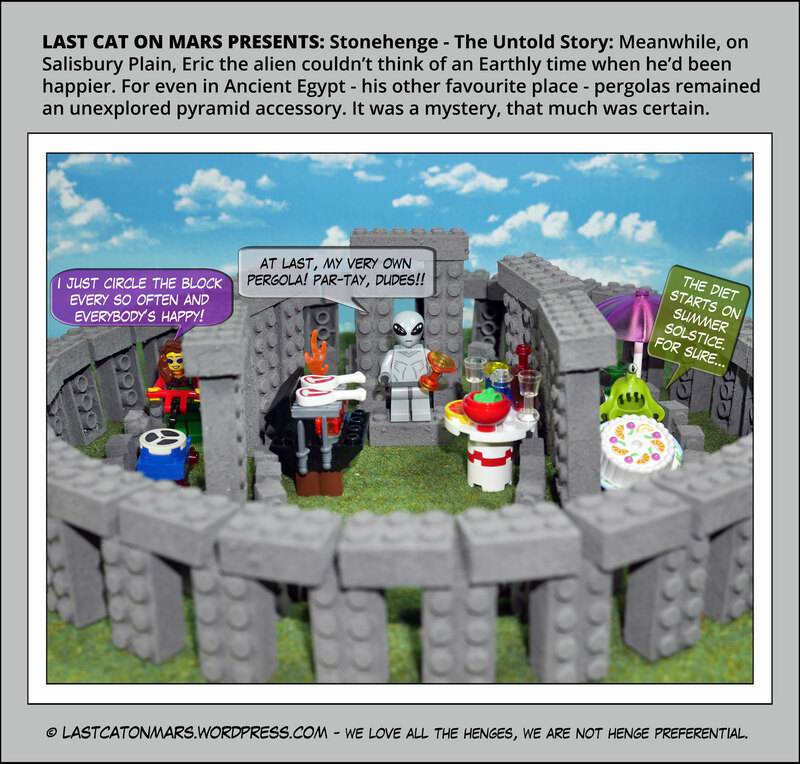 For Eric the alien, and a lot of humans and felines besides, there is nothing at all more peaceful than to picnic at a cemetery, which is one of Stonehenge’s assumed reasons for existing. Being a cemetery, and then being a picnic spot. Also, it’s a great place to rest on your way to Avebury, infinity, and beyond, although I’ve heard that getting a park is difficult from time to time. If you go, enjoy the greenery, the greyery, and the gruesome knowledge that human sacrifice was a thing even and especially thousands of years ago. Say hello to Eric for me. Those Neoliths, gotta love ’em. 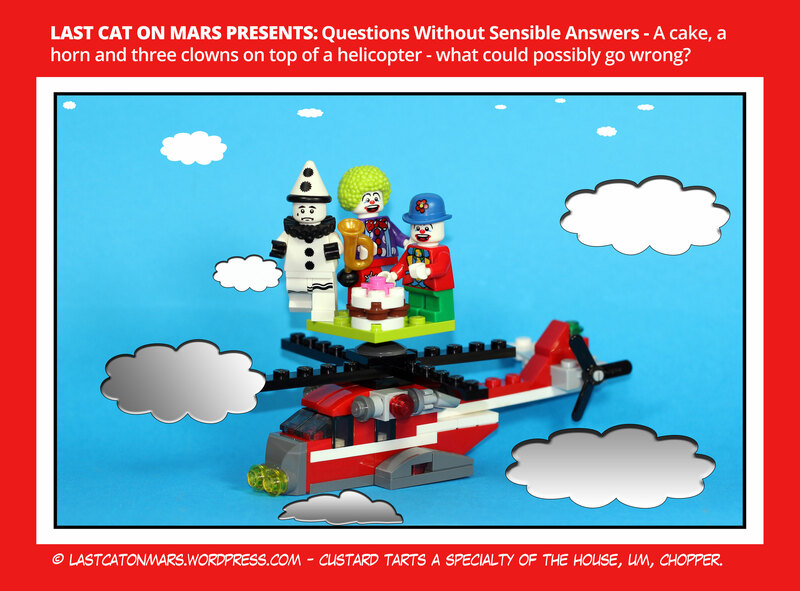 This entry was posted in Variety Show and tagged alien, barbecue, bbq, cake, cartoon, comic, minifigures, mower, Stonehenge on February 15, 2017 by Jay Verney. While I’m not given to effusive celebrations here on the red planet at this time of year, I fully appreciate the excitement gathering speed on the third rock. I well remember Mama and Papa and my sibling, Sibmo, enjoying each other’s company way, way back when we’d dip a delicate paw into the backyard pool before emptying it so we could stretch out and sleep on those cool, cool yule tiles in the midst of tropical summer heatwaves. And is there anything more sublime than Bill Evans on the old CD player as you barbecue your tuna steaks and sip a delicate and frothy tunanog while swaying along to one of the coolest dudes in the jazziverse? 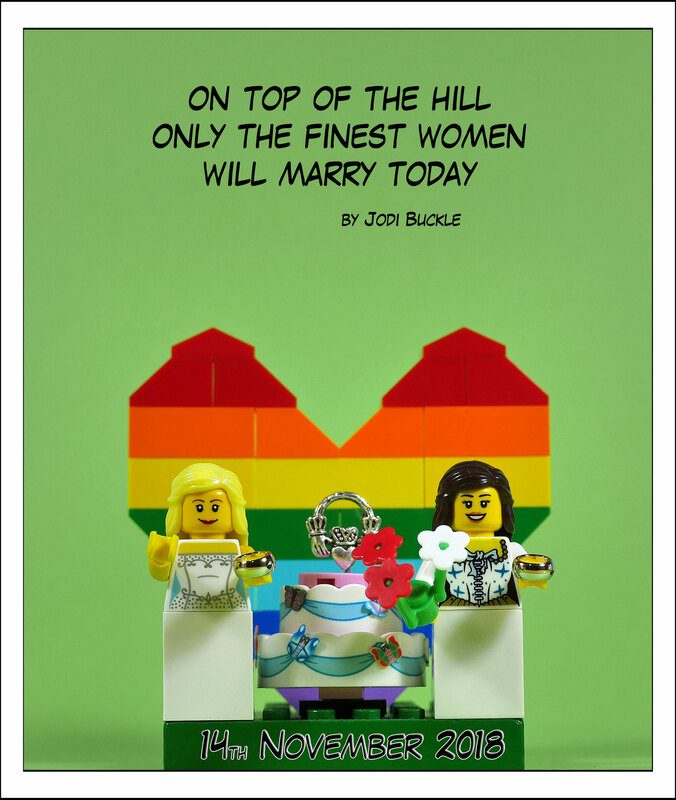 I think there is not, my dearest friends, so I’m off to get in some practice before the big day in my rainbow robes of wondrous, all-inclusive hue. Meanwhile, let’s all send healing vibes of peaceful energy from wherever we may be to surround and suffuse little mother Earth with kindness and the calming balm of love. I mean it, dudes, let’s start vibing the positive before the place does itself an irreversible injury, okay?! Okay-a-rooney. 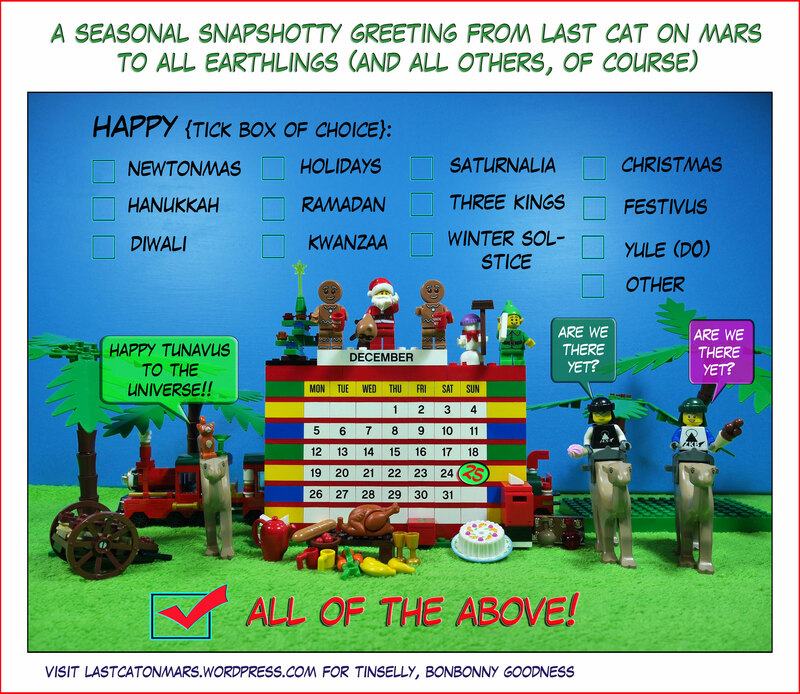 This entry was posted in Snapshots, Special Occasions and tagged cake, camels, cartoon, Christmas, comic, Dr on Mars, elf, food, gingerbread men, Holidays, Last Cat On Mars, lego, minifigures, Santa, season's greetings, snowman, turkey on December 22, 2016 by Jay Verney.